Posing in the backyard after the run. A great way to stay fit, have fun, and to meet new people is to take part in local sporting events. 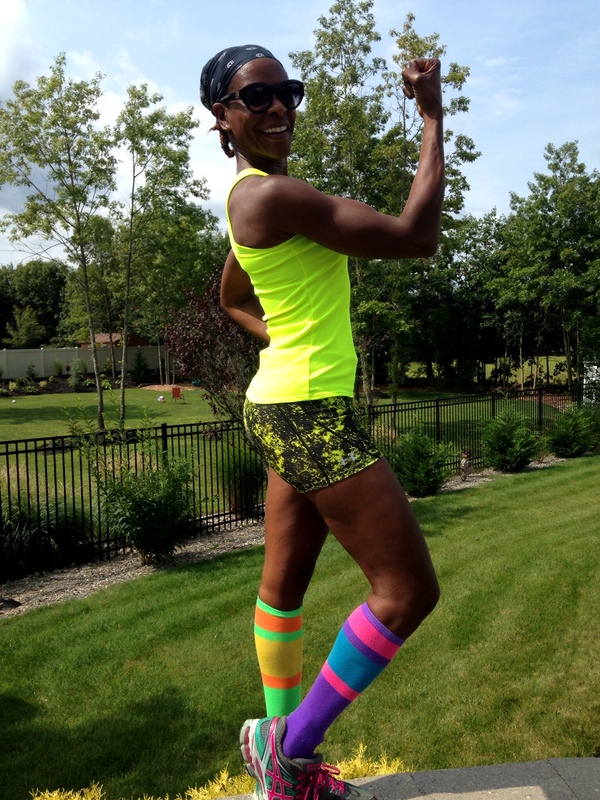 I find events by talking to other fitness fanatics and from one of my favorite sites, Active. 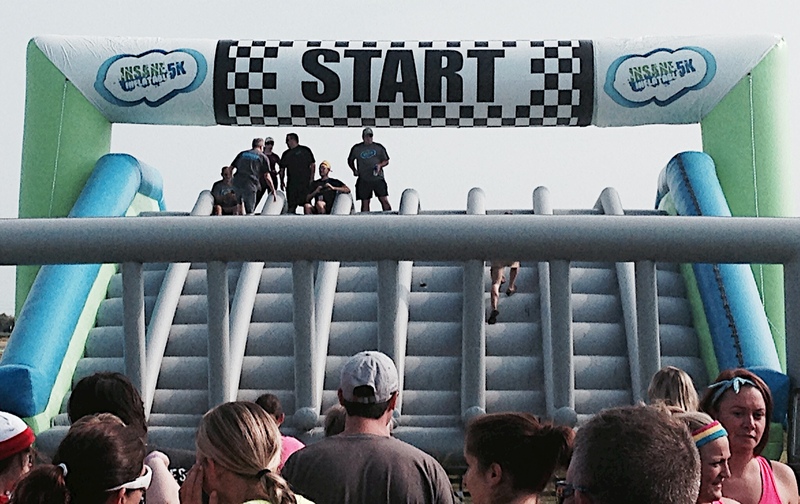 Yesterday, I participated in Atlantic City’s first ever, Insane Inflatable 5K. Inflatable what? I know! Lol!! I thought the same. But once I visited the website, back in March, I knew I had to do this crazy looking event. You can see pics of yesterday’s run here. I took this picture just before the start. The folks at the top are event organizers getting us all pumped up. Look at the size of this baby! Lol!! I do not have my own pics because I ended up running solo because hubby and B’Dazzle were still sleeping when I left the house. Next year, the entire family is participating! And yes, I already put them on notice. 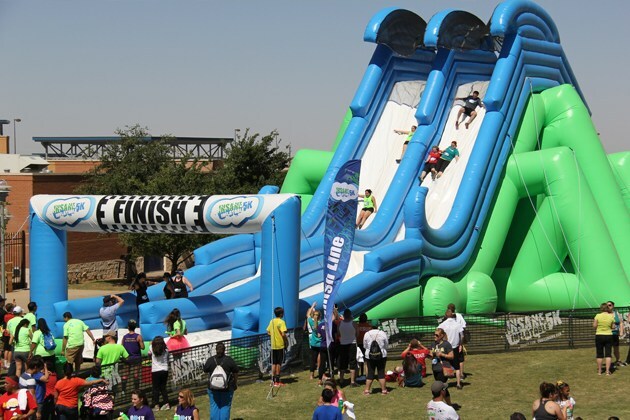 Our son will love it; I am not certain about hubby, but it is a perfect family “active” event. Lol! Oh… it’s definitely ON for next year. One group of women I met drove nearly two-hours for the challenge. The course was set up at an old airport. Parts of the course were paved, other sections included two-foot high weeds; we laughed at the “battlefield” and dodged potholes through most of the run. 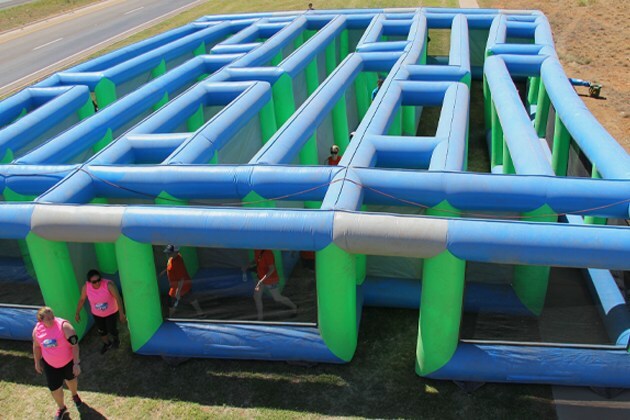 I have always lacked a sense of direction and was thankful to run through an insane maze following some girl. We ran through only to find that we were at the start of the maze. Sigh! Back in again. Of course, I ran right on her heels. I really thought we were running in circles, but she got us through… I thanked her! Lol! This morning, I feel like I weight trained yesterday. My hamstrings, quads, and shoulders are sore. No longer do I feel guilty about not hitting the gym yesterday. With your doctor’s blessings, this is an ideal way to get started. Just do it! The run is not timed. There are no losers. Everyone wins by showing up and having fun. My number one goal is to have fun. Be silly and laugh at yourself. Don’t take yourself so serious. Be open-minded to try something new. There are many ways to exercise, dabble in something completely different. This inflatable run was different for me. Seek new challenges and set new goals. Ex: A mud run is on my to-do list. Confidence grows steadily with accomplishments. Stay away from the scale; it is not an accurate measurement of your overall fitness level. Be aware of what you eat and drink. Read labels! Drink water! Set your mind to try new recipes. I eat foods today that I did not know existed a few years ago. I continue to add new healthier foods to my diet and subtract foods that I discover are unhealthy. Connect (In person or on Facebook, Instagram, Twitter, etc..) with other fitness fanatics. We will encourage and inspire you and help to keep you motivated. Educate yourself. Read about nutrition and fitness every opportunity you get. The social networks are saturated with fitness guru’s who are eager to share what they know. Of course, everything you read is not true or accurate, so do your research. Right now by favorites are bodybuilding.com and fitnessrx for women. I follow a few good boards on Pinterest; you can follow me there at Lexa82. Don’t give up. If something does not work for you, move on. Remember, there is no such thing as perfection. Don’t compare your body to someone else’s. Just work to be YOUR best. Don’t be afraid to participate in an event by yourself. You will make new self discoveries and gain lots self-confidence. After the run and later in the afternoon, we (hubby and B’Dazzle) met other family and friends at a free outdoor concert at Gardner’s Basin in Atlantic City. The weather was beautiful! I sat in my beach chair, chilled, ate, drank two well-earned margaritas, danced to a DJ and to the sounds of S.O.S. Band. Remember them? 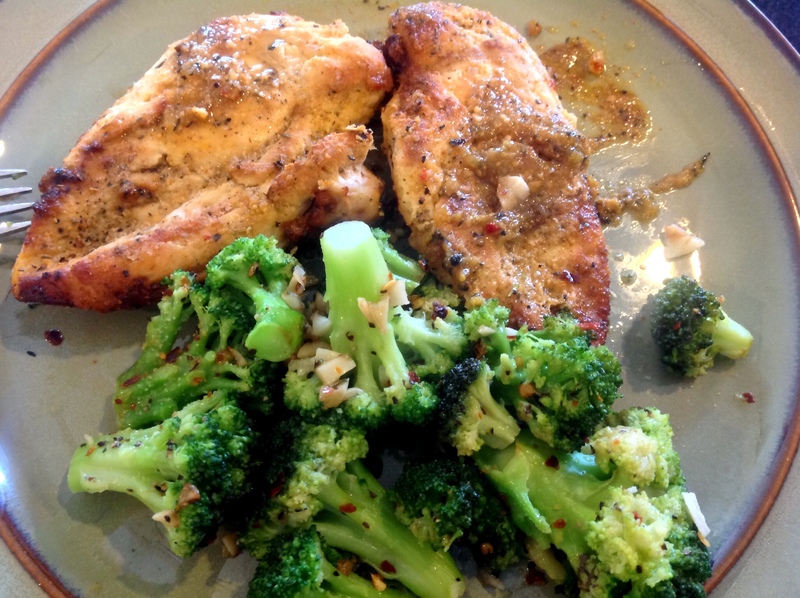 Post workout meal at 10:30 a.m. — Leftover broiled chicken breast and freshly sautéed broccoli. Mmm… See all that minced garlic? I Love it!! Personally for me, eating well and exercising makes me feel amazingly well. Increased energy, better productivity, and an overall happier mental and physical state of being are some of the benefits of living a healthier lifestyle. 49 feels way better than I ever thought possible! I cannot stress the importance of making fun a part of your fitness regimen. This is how I do it! This entry was posted in Family Living, Fitness, Healthy Living, Inspiration, Uncategorized and tagged 49, 5k run, Atlantic City, Broccoli, fit mom, Fitness, fitness fanatics, fitness motivation, funrun, Grilled chicken, healthy lifestyle, healthy-living, Inflatable run, staying fit, women, women in the gym, Women over 40, women's health. Bookmark the permalink.